I approached Unread thinking that it was an app designed for people who subscribe to a handful of feeds and just want to read a few articles every day. What I found is an app that works exceptionally well with hundreds of feeds, that has great custom typography and interface choices that don’t look out of place on iOS 7, and that tastefully implements modern gestures, sharing controls, and iOS technologies. 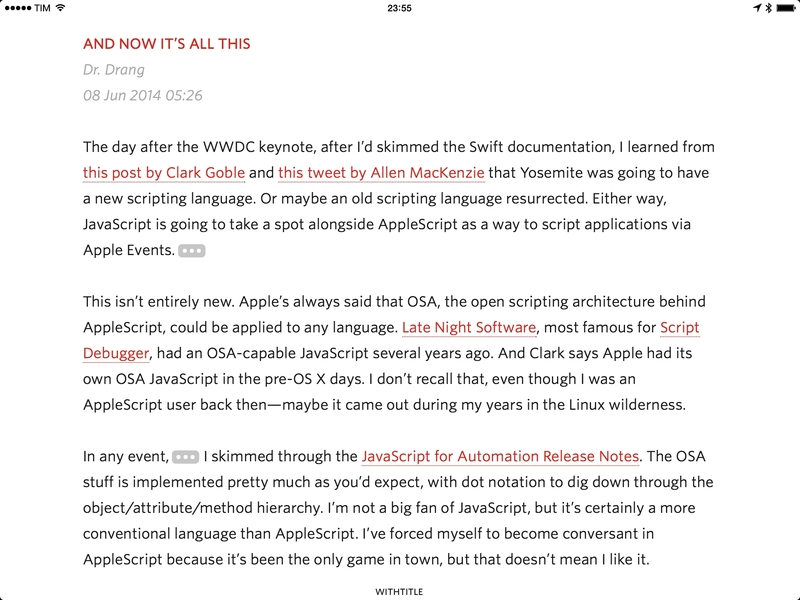 For me, Unread provides a better reading, syncing, and sharing experience than Reeder. While it lacks some of the features that Reeder gained over the years, Unread’s debut shows an app with focus, flexibility, attention to iOS 7, and the capability of scaling from dozens of unread items to several hundreds articles. Some people will complain about the lack of a compact mode to disable article previews in the main list; combined with thumbnails, I realized that this feature helps me pay more attention to articles in my RSS feeds. Today, Sinclair has released Unread for iPad, a new version of the app sold at $4.99 on the App Store. Unread for iPad is heavily influenced by its iPhone counterpart, and fans of the iPhone version will be instantly familiar with it. 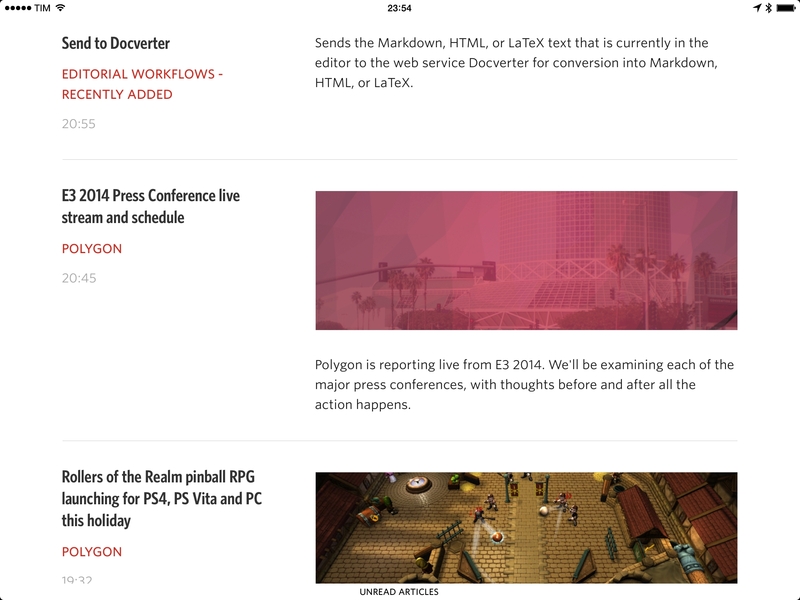 Unread's raison d'être – providing a focused and comfortable reading experience for RSS feeds – has been ported tastefully to the larger screen. The feature set is the same of iPhone version, with basic sharing options built-in and a strong reliance on gestures to switch between articles, open the web view, and show the action menu. On the iPad, Unread looks and behaves almost exactly as the iPhone version: the layout has been mostly scaled up for the iPad's canvas, and while this may appear as an “easy” choice, it allows the essence of Unread to be more valuable on the iPad. Thanks to the larger screen, Unread works better for two core aspects: focus on text and comfort. When reading, the iPad makes Unread feel like an Instapaper-esque read-later app: the entire screen is just words with no toolbars or other extraneous interface elements. The effect is refreshing: while many RSS readers try to get away with the larger screen by adding features and menus (and thus complexity), Sinclair stripped away as much as possible and the result is a clean, friendly reading environment. If you care about reading articles rather than quickly skimming them or creating complex sharing actions, Unread feels great on the iPad. The layout of the article list has been tweaked on the tablet, showing titles and excerpts in two distinct columns that, however, comprise a single tap area. While I wasn't initially sure about the change – I'm used to having feeds presented with titles immediately followed by images and some text – I now find the separation of headlines from summaries to make sense for the way I want to quickly identify an article I want to read. Gestures are more comfortable and fun, too. I'm a big fan of Sinclair's appreciation for sloppy swiping, which Unread for iPhone got right with its one-handed operation, large touch targets, and contextual transitions and animations. On the iPad, swiping to trigger actions or pulling up to switch to another article is even more comfortable and rewarding: large panes of content slide across the screen as you swipe and the action menu features bigger empty areas you can tap on to dismiss the view and go back to reading. 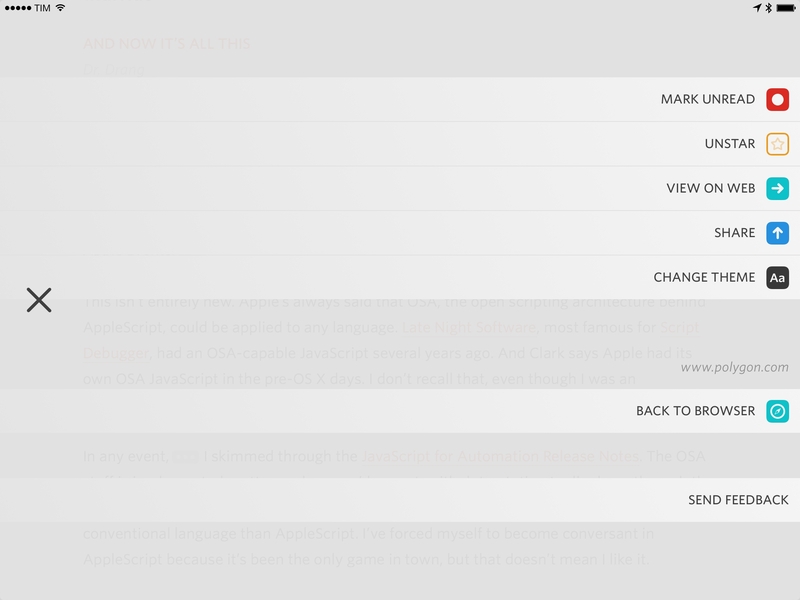 Controls have been placed around the areas where your thumbs would rest when holding the iPad, and this contributes to making interface complexity disappear when using Unread because interactions feel smooth and natural. There isn't much else to say about Unread for iPad, which may not be what some users were looking for in a port to the bigger screen. Unread is not Mr. Reader, and, like the iPhone app, it comes with a limited set of features exclusively aimed at providing a fantastic reading experience. While I still don't know whether I'll promote Unread to my Home screen like I did on the iPhone, I love how the app feels on my iPad mini and I've enjoyed reading my RSS feeds with the tranquillity offered by Sinclair's design choices. Unread is a great reading app that's based on RSS feeds – and that's an important difference to consider if you're coming from a traditional RSS client. Unread for iPad is available at $4.99 on the App Store.